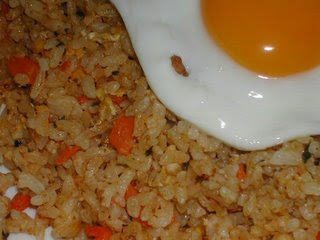 Nasi Goreng (Fried rice) is actually a breakfast dish in Indonesia. It is often made from the boiled rice which may have been left over from the previous night's meal. Slice the onion lengthwise, heat the oil and fry the onion, garlic, chilli and shrimp paste until the onion is soft. Add the rice and salt to taste. Mix thoroughly while constantly turning until every grain is coated. Then add the soya sauce and mix again until the colour is even throughout. The rice should have taken on a nice orange-red tinge from the chilli powder. Cooked meat or prawns can be added with the soya sauce. Onion crisps (Goreng Bawang) is used as a garnish. To make it 'istimewa' or special, a lightly fired egg, some cucumber slices and kerupuk (prawn crakers) are served on top of the rice.